Tonight is my night to host the weekly sewing circle, so I made cake. White vanilla cake, with a secret. It's made with tofu! 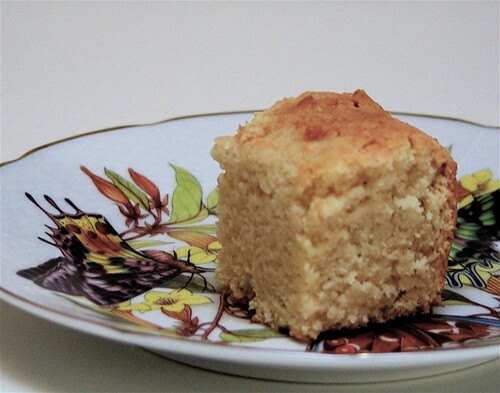 The recipe is "tofu pudding cake" and it uses a box of silken tofu plus a pouch of tofu pudding mix. It's dairy-free, or would have been had I not used butter. Desserts at sewing group are encouraged to be test desserts. You know how you would not try a recipe for the first time when you're having a bunch of work friends over? Well this group is not like that, we're all about testing and learning. This one looked like an interesting recipe, I wondered what the tofu would add. The taste, of course, is the thing. And this one is delicious. The tofu gives it an interesting flavor layer, like there's something else there but you don't know what (in a good way). I had to taste a little piece--just to make sure it was ok, you understand--and kept on taking little slices all the way across the cake until I had eaten more than half the row! It's a hit with me, we'll see what everyone else thinks of it. Now I must go and pick up the boatload of toys that are scattered about before people arrive. sweet. sewing AND cake? i'm in! Oh, it looks delicious! I love a plain yellow cake--with the extra flavor layer, of course. Just right for spring, too. Hope the sewing goes as well! I am always surprised by the crazy stuff that goes into vegan treats... and how GREAT they taste in the end. sometimes better than the non-vegan stuff. and you can easily sneak them onto unsuspecting plates and the tasters are none the wiser! Wow, it sounds delicious! I look forward to hearing what the group thought of it. A sewing circle sounds like a wonderful thing to be a part of. Love to join you there, Amanda. Yum. Sewing. Cake. Friends. New Recipe. Sounds heavenly!